The similarities between telescopes and camera lenses make it possible to use them interchangeably. The differences make it a bit of a challenge to use a telescope as a camera lens, but fortunately, the reverse is not as difficult. Converting a camera lens into a telescope will not allow you to view deep sky objects, but it will work as well as a small telescope for viewing the moon, planets and other close objects. Mark the exact center of the rear lens cap using a ruler and drill a 1.5-inch hole. Attach the PVC adapter to the lens cap by inserting it into the hole and then gluing it in place using the epoxy. Allow the glue to dry before moving on to the next step. Drill a small hole near the end of the PVC adapter. Insert the set screw just enough to hold it in place. This will be used to secure the eyepiece. Insert the eyepiece into the adapter and secure it in place by tightening the set screw. Attach the lens cap and eyepiece to the zoom lens and attach the zoom lens to the tripod. Focus the lens by manually twisting the lens. Different sizes of zoom lenses will be better for different things. A 200mm lens will give good views of the moon, while a 600mm lens will give great views of craters and some of the planets. If the focus or magnification is insufficient, adjust the space between the lens and the eyepiece by loosening the set screw and moving the eyepiece back and forth. 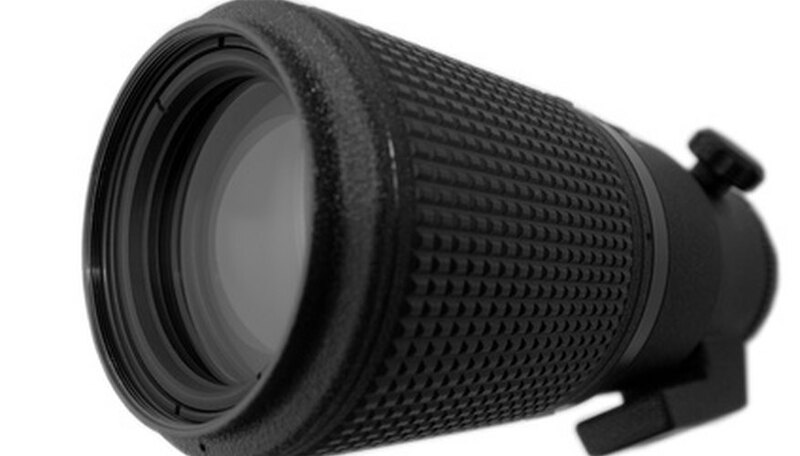 You can use different eyepieces to get better pictures or view more distant objects. Diagonals work well for viewing deeper objects. If the eyepiece is not placed in the center of the lens cap, you will not be able to focus properly. Measure carefully before drilling. Optical Hardware: The Difference Between "Astronomical Telescopes" and "Spotting Scopes"
Goldstein, Mike. "How to Make a Homemade Telescope Using Old Camera Lenses." Sciencing, https://sciencing.com/make-using-old-camera-lenses-6805761.html. 24 April 2017.